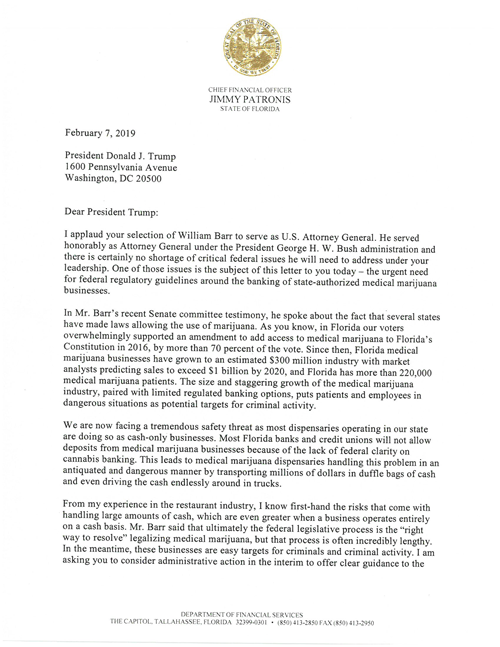 TALLAHASSEE, Fla. – With the U.S. Senate Judiciary Committee voting to advance William Barr’s nomination for U.S. Attorney General today, Florida Chief Financial Officer (CFO) Jimmy Patronis sent a letter to President Donald J. Trump on the urgent need for greater clarity regarding federal regulatory guidelines around the banking of state-authorized medical marijuana businesses. The letter can be found HERE and below. 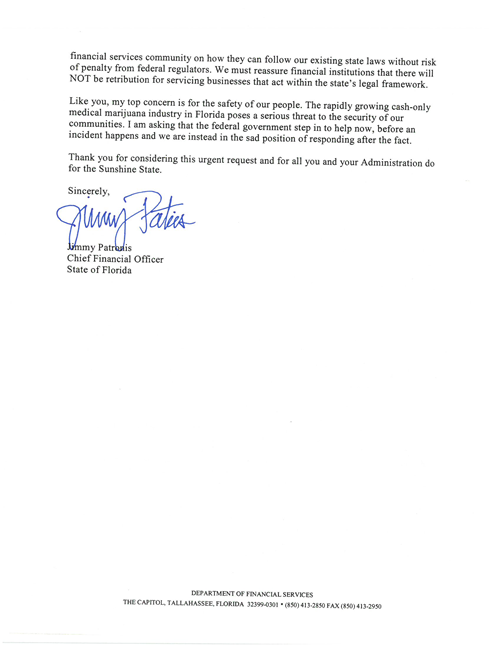 Chief Financial Officer and State Fire Marshal Jimmy Patronis is a statewide elected official and a member of Florida’s Cabinet, who oversees the Department of Financial Services. CFO Patronis works each day to fight insurance fraud, support Florida’s firefighters, and ensure the state’s finances are stable to support economic growth in the state. Follow the activities of the Department on Facebook (FLDFS) and Twitter (@FLDFS).